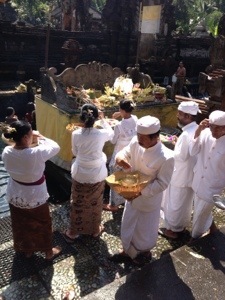 Ubud is where I’ve made my final home in Bali and it’s also the heart of the island’s cultural and artistic community. It’s the type of place you’ll leave feeling like you didn’t have nearly enough time to explore either, so I’ve had to balance my attempts at taking life as it comes with a few actual decisions here and there. Without realizing it I booked my stay here in one of the many villages surrounding Ubud – I’m in the charming village of Nyuhkuning, just south of Central Ubud, with its quiet streets and friendly neighbors, but conveniently just a short bike ride through the Sacred Monkey Forest to the hopping part of town. There are about 600 monkeys in the Sacred Monkey Forest, held “captive” merely by the truckloads of sweet potatoes and bananas bestowed upon them by the local government. It’s a unique tourist attraction in its proximity to such a bustling area, but its density (in both forest and monkeys) makes you feel worlds away. 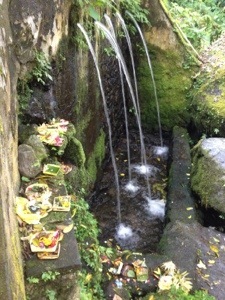 There is a river running through it as well as the multitude of mossy stone temples and statues I’ve come to expect everywhere in Bali. I’ve made a stroll through the forest a part of nearly every day, with frequent breaks to watch the monkeys go about their monkey business. They are fascinating creatures to observe, especially uncaged and in a nearly authentic habitat. 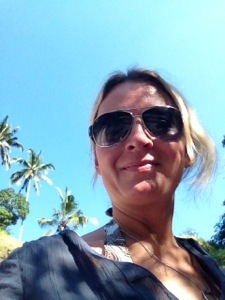 I’ve also spent a fair amount of time shopping in Ubud. With so many villagers coming to the city to sell their wares – batik (special hand-dyed fabric), wood and bone carvings, paintings, handmade jewelry and a slew of other crafts – it’s hard not to indulge, especially when you know you’re supporting the local artist community. Furthermore, it seems much easier in Ubud than in places like Mexico and the Caribbean to separate the crap from the genuine articles. But there’s also an element to traveling in Bali that makes everything seem more genuine – the hired driver. They are literally everywhere and for around $30 per day you not only have access to first-hand local information, but through the long, winding drives you become witness to the source of everything – workers harvesting native crops like rice and peanuts, plus village after village where you can actually see the wood carvers, the batik painters and other craftsmen at work. While you might find what appear to be the same souvenirs in shop after shop, you can be sure that no two bamboo wind chimes are exactly the same because you saw a man with your own two eyes making them three villages away. Today was an interesting blend of experiences for me. I effectively ate my way through Ubud and its surrounding villages with a stop in the middle to have what I feel has been the most spiritual moment of my trip. First, the eating. I dedicate this section to my beloved best friend, whose spirit has guided me through all of my meals over the last two weeks. 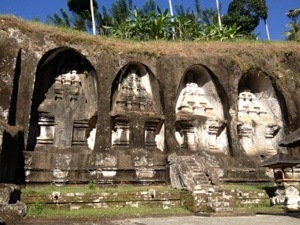 It started innocently enough – I set out early with my driver to get to Gunung Kawi, one of Bali’s most ancient historic sites, in order to miss the tour bus frenzy that starts up as early as 9AM. Because of this I missed breakfast at my hotel and asked my driver to stop at what I now believe is the only Starbucks in Bali. I’d happened upon it the day before, after I’d set out to bike around the infamous rice terraces, only to have the chain come off a mile or so in. With no triathlete husband in sight, I was forced to walk the bike all the way back. And that’s when I noticed the familiar green mermaid I’ve come to know and love. I decided then and there that would be my plan for breakfast this morning. Ah, but to no avail. My old friend is on Balinese time it seems, with doors opening at 9AM, by which time every other person on the planet has already had their grande nonfat lattes. Wow, I digress. Saber, my driver, suggests the nearby Cafe Luna and her delicious sister, Honeymoon Bakery, and this, my friends, is where the madness begins. You would think a caffe latte and a chocolate croissant are nothing special until you realize that you are drinking the caffe latte and eating the chocolate croissant. 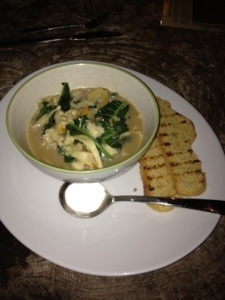 I tell you, it’s like I was in Bali, Italy and France, all at the same time. Maybe it’s just that I’ve had my fill of the local fare, but as I inhaled the last flaky, salty, gooey, chocolatey bite of my croissant, I decided that today would be a day focused on Western cuisine. I only felt guilty about this long enough to recall the rave review in my guidebook about a pizzeria near my hotel as well as the fried chicken stand I noticed on the way home from dinner last night. But since I’m an equal opportunity eater, I still had Saber stop at the Warung Teges, noted by Lonely Planet as being the locals’ favorite lunch spot. Nor am I going to refrain from housing a delicious bowl of my hotel’s rice noodle soup in the next 5 minutes. I will go to bed one very happy babi guling (suckling pig) for sure. To close on this post I will now share one of the most special experiences I’ve had here. 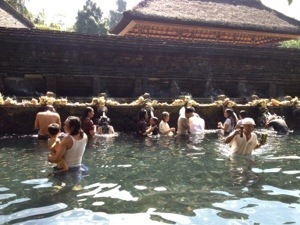 After trekking up and down the many steps of the Gunung Kawi site, Saber suggested a stop at the holy spring waters just a few minutes away. 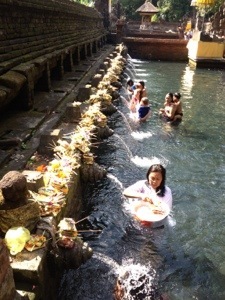 Now at this point I’m convinced I’ve seen every spiritual act there is in Balinese Hindu culture – the offerings, the prayers, the ceremonies, the rinsing, the repeating. But this was something new. 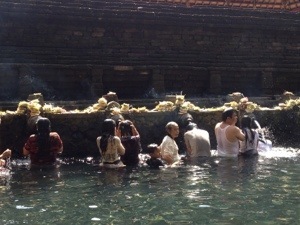 I sat on the edge of a crystal clear (holy) spring water pool and watched for the better part of an hour as Balinese people of all ages ritually cleansed themselves in a series of fountains. Others were making the traditional offerings to the Gods – the carved stone fountains were stacked with them, incense billowing everywhere. But amidst all of this religious activity, there were wrinkled smiles and children’s laughter, teenage flirtations and polite affection between husbands and wives. This was…happiness. It was overpowering for a moment as I was brought to tears of joy. This, for me, is Bali – a culture rich with a genuine faith, a devotion not only to God, but to family, and to the earth, and to each other. I will hold onto this vision forever and be reminded of the overwhelming kindness these people have shown me. Some may say that Bali is just as corrupt as any place in the modern world, but I say you don’t have to look very hard to see into the true heart of the Balinese spirit. They wear it right there on that big, beautiful Balinese smile.